Avatar Wars. The Battle of the Century! The world of avatars has begun! Use your avatar as a weapon to defeat other avatars! Become the greatest and claim the throne as the KING OF AVATARS!! *bounces it back again* Haha, my inflatable skin outmatches whatever you throw at me! "Diz iz gunna go leik, Ka-Blooi reel zoon!" Winter used the super power of winter and made it snow, causing Bob to slip and miss and fall into a freezing lake! Bakura summons Dark Ruler Ha Des and incinerates Winter and Umbreon! I am a main character (admin) therefore your Duel monster attack is invalid. I break the rules! Meaning his attack still obliterates you. "Screw Chuck Norris, I have money!" Kaiba just stood there as C.N. 's punch went right through his body as if he was a ghost. Same for Umbreon. Bomberman Throws a whole bunch of bombs randomly at people! "Fire in the whole*!" Kaiba: "Screw the bombs, I have money!" he then looked at the fist of C.N. that's going straight through him, like a ghost and looked at C.N. and said: "You don't have a... ghost of a chance!" Freaked-out-Shadow waved his arms frantically waved his arms at Bob! Axel used some-kind-of-flame-attack! Bob shriveled up! The cat jumps off of the floating Shadow head and punctures Bob's inflato-head. Darklit Planets align! Neku used Black Uranus! Everyone was pwned! Starlo used he star spirit powers and protects Virtual Craze! The cat (he's nameless atm =.=) scratches up bob, again! Black Bomberman burys a bunch of bombs in random places turning them into mines! Axel sets bomberman on fire thus causing him to blow up! How dare you blow up my life sized sculpture of BomberMan! Oh, and you still have that little mine problem on your hands, don't you? The floating Shadow head thinks other wise. Axel thinks otherwise and sends sonic to grab him a slice. Axel used "Author Powers" to attack! He safely put sonic back next to him and sent Kino (the cat) out to attack Bob! 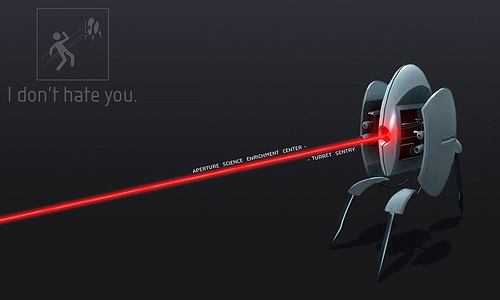 GLaDOS sends the turrets out! 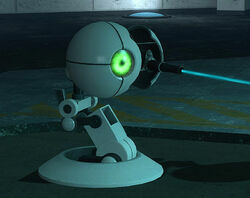 *heheheheheh.....* Ummm....Turrets have no way to move around or turn their bodies. All you need to do is sneak up behind them, grab them and drop them. They do let out a stream of bullets once they break....but behind them, they can't get you...Also, all you need to do is drop them from a height of six inches, and then they break. Oh! Oh! Turret tipping! A great past time of mine! Rocket Turrets fired at Bob! Subject: Re: Avatar Wars. The Battle of the Century!